Sometimes things go wrong in your knitting. Sometimes they go so wrong that you have to put down what you’re working on and just knit something quick and pretty to restore your faith in knitting. After the ill-fitting cardigan debacle I needed just that so I decided I would knit a cute beret using a stunning skein of Madelinetosh Tosh Vintage merino in baltic that has been calling my name lately. Considering my recent knitting catastrophe, I should have known that the knitting gods had it in for me. I carefully loaded the unwound hank onto my umbrella swift and snipped the knot to free the two loose ends. Now, if there is a science to choosing the right end to wind from, obviously my hypothesis was WRONG. Almost instantly, I could tell that the end I chose was coming from the underside of the hank, so I removed it from the ball winder and tucked it in on the underside of the hank. I then grabbed the other end, which was obviously on the outermost portion of the hank and began to wind. But then it ended up that this new end was also somehow pulling from the underside of the hank, and my hank kind of flipped over on the swift. Not wanting to create a tangled mess (oh, the foreshadowing! ), I took the hank off the swift and laid it on the table next to the ball winder and decided to wind it without using the swift. This was apparently an even worse decision. Like a car crash- instantaneously and without fully understanding how it all went down- I ended up with the most tangled skein of yarn I have seen in a good long while. I don’t have a lot of patience for tangled messes of yarn, especially when I’m really just trying to restore my faith in knitting– I mean, a tangled mess of yarn is the last thing you need when you’re in my state— but this skein was too beautiful (and costly) to just toss in the bin. So the past two nights, I have spent my free time untangling yarn. Yep. Two whole nights of knots and tangles, and having to cut this 200 yard skein into smaller balls just so I could make some sense of the jumbled mess. 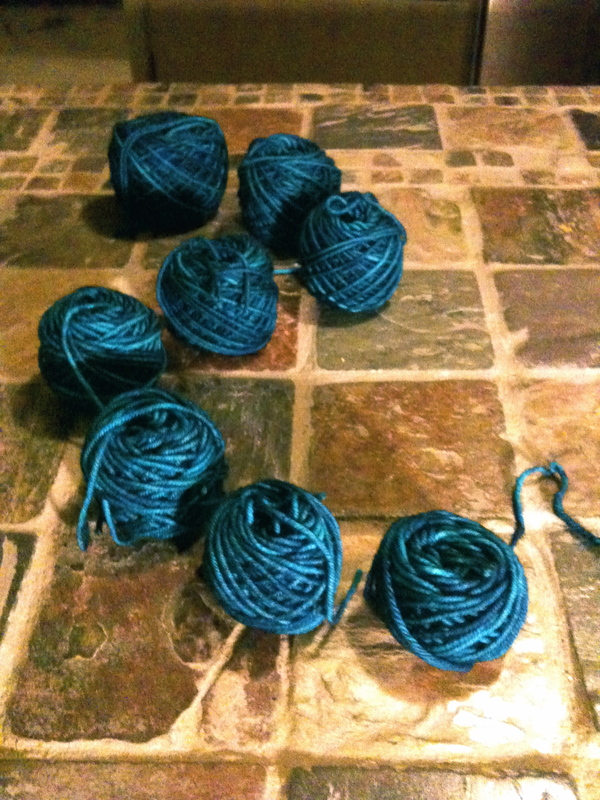 Eight 25-yard (give or take) balls of yarn. Clearly, my luck hasn’t turned just yet. Perhaps I should just climb back into bed and pull the covers over my head. And then maybe I’ll cast on tomorrow. Oh no! More power to you, though — you actually have it all balled up now. I still have a messy wad of disastrously wound pink angora/wool blend stashed in a closet, as I’m unable to face dealing with it. oh no!!! But at least you’ve salvaged it. That colour is utterly stunning. Maybe it will reward you for all your effort by knitting up into a really lovely item. I admire your patient persistance.